After pregnancy, it is necessary to realign your spine. Standing in the water allows you the maximum stretch between your hip bones and your ribs as you lift your arms above your head. Aqua yoga makes use of deep breathing in relaxed stretches that are easier and safer in water than on land. Your ligaments are still soft and should not be overstretched for at least four months after giving birth. Practice these simple standing stretches to lengthen your spinal muscles and breathe deep under your diaphragm where your baby was lying just a few weeks ago. Consciously, with a deep, long breath, close and lengthen your whole body. As you stretch your arms above your head, extend to the maximum as you inhale and exhale as deeply as you can. At the end of your exhalation, relax completely and “flop” your arms before you start stretching again on the next in breath. The fullness of the relaxation is as important as the extension. 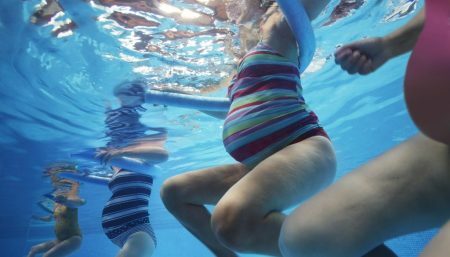 After expanding your breathing capacity during pregnancy, breathing for two, you need to continue using the same muscles, which are no longer stretched by your fully grown baby. You can make the previous stretch more extreme by extending one arm over your head and breathing more intensely in your intercostal muscles: the little muscles between your ribs. Repeat on the other side. After extending your arm to the maximum above your head, lower it towards your other arm, keeping your chest wide open. Breathe as deeply as possible. Even more stretch can be achieved by adding a sideways extension to the previous exercise. With your straight legs together, stretch your whole body in an oblique line, holding on to the bar or pool edge to stabilize yourself with one hand. Stretch first to one side, then to the other, and breathe fully on each side, being aware of creating on long stretch from your feet to your extended hand. This creates an intense stretch in which you breathe deeply for two or three full cycles before you change legs. Facing the pool wall, take a wide step so that your front foot can rest at the base of the wall. Bend your front knee and lift your foot to bring it on to the knee of your extended back leg. As you become stronger and fitter, you can practice this classic leg stretch in different ways. At first you may want to rest your leg on the bar, if there is one (the pool edge may be too high). If there is no bar, it may be sufficient to start with to bring your extended leg up, at any height comfortable to you on the wall, while keeping your standing leg bent. Being in water allows a greater stretch than most people can achieve rapidly when doing on land and strengthens the muscles at the base of the spine that contribute not only to physical fitness but to vital energy in the body. You can use a short woggle to support your leg. Hold both ends and rest your foot in the centre. Straighten the leg, bringing your foot up to shoulder height at the surface. Eventually, you will be able to extend both legs, using your stretched legs to pull your back even straighter as you breathe in the pose. 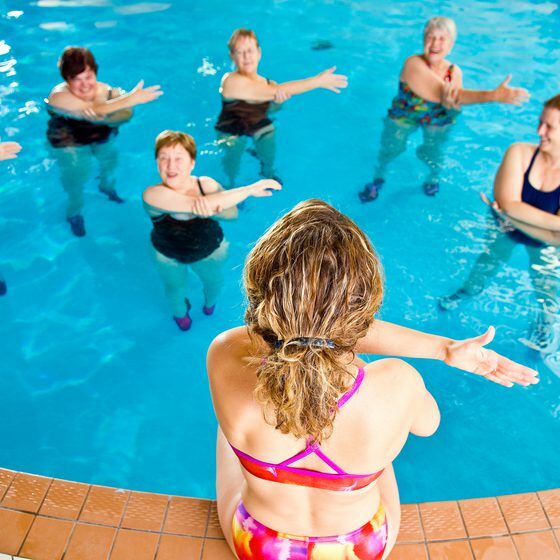 The standing twists are a great help in recovery of your waistline, and you will get it back sooner by doing them in the water than you would on dry land. Do the twists facing the wall and holding on to the bar or the pool edge, or facing the pool and holding onto a woggle, or standing freely. As in all the yoga postures, it is deep breathing that makes the twists effective. The combination of twisting and rolling movements helps to keep your hips supple after pregnancy and prevents postnatal lower backache. If your pool is shallow, you can use kneeling versions of the standing postures. Keep your neck soft and relaxed as you twist. The postures are very helpful if you have split your abdominal muscles in late pregnancy or during birth, and they are recommended if you have had a Caesarean section. Stand with your back straight and your feet together, bending your knees slightly if necessary to get a better alignment. For the straight twist, bring your right leg in front of your left leg and place your right foot firmly on the pool floor about 30cm/12in to the far side of your left foot. Keep your hips facing forward. Breathe deeply in the twist a few times, then change legs. The sideways version gives a more extreme stretch which does not involve opening your hips. Turn both feet to the same side while keeping your trunk facing forward. This is a soothing movement for the lower back which also tones the abdominal muscles as you breathe rhythmically with the roll. It can be done facing the wall or the pool, supporting your arms on the bar or on a woggle. If you are in a shallow pool, you can “twist-roll-bend” in a sitting position with your back straight, supporting your arms on a woggle and moving your knees to one side. Start from a standing position with your feet together. Keeping your back straight, bend your knees slightly and turn them to one side, creating a gentle twist. Then roll your knees in small circles on that side, bending more as you come to the centre. Make it a fairly energetic movement, breathing in a rhythm that helps you twist further. Repeat on the other side. It is an excellent pose to practice after giving birth. Start with your back straight and your knees slightly bent. Lift one leg and bring it over your other leg, binding your foot behind it as high as you find comfortable between the ankle and the knee. Feel the closing twist of your hips and breathe as deeply as possible for a minute or two. Then unfold your legs, returning to a standing position, and change sides. Open your arms wide and bring your right arm over your left arm, crossing them at the elbows if possible. Pull your right forearm to the right and bring our right hand forward to meet your open left hand. Breathe deeply for a minute or two before unfolding your arms. Change sides and repeat. This is a powerful toner for the muscles of the upper arms. Let your body be the guide-never over-do the exercises and stay committed.